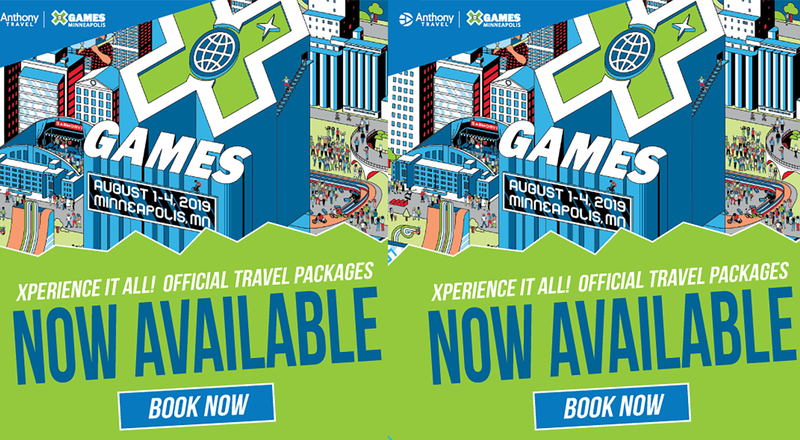 X Games just wrapped the second year in its new summer home of Minneapolis. We have been showcasing the best images and moments from the 2018 event here in this rolling gallery, which we updated all weekend. 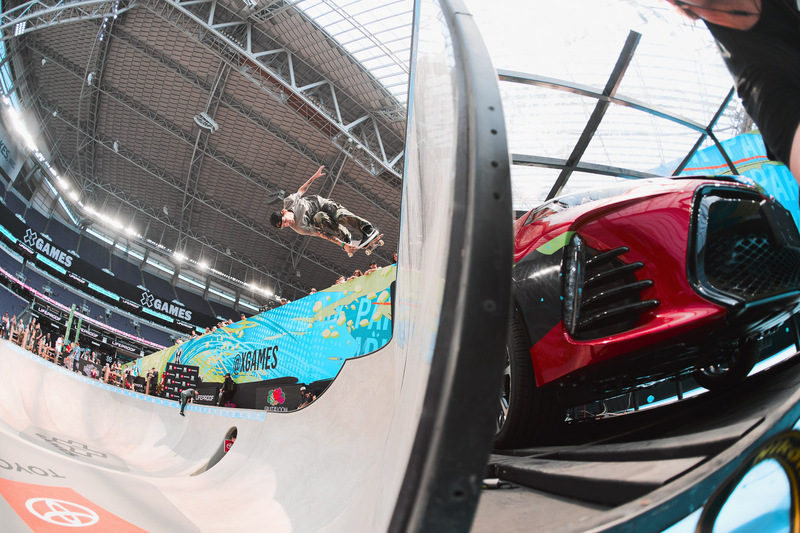 Click on to see all the photo highlights ... Pictured here: Minnesota native Nicole Hause skateboarded in Women's Skateboard Park final in front of a packed house at U.S. Bank Stadium on Sunday, including a reserved section of 100 seats for friends and family. She finished fifth in the end but more than made up for her podium miss with massive airs, far bigger than the rest of the field, in the deep end. 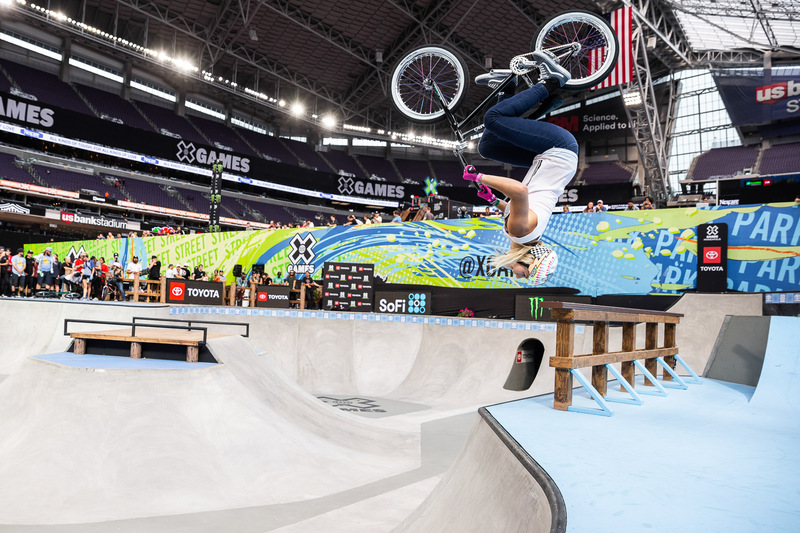 Pictured here: Minnesota native Nicole Hause skateboarded in Women's Skateboard Park final in front of a packed house at U.S. Bank Stadium on Sunday, including a reserved section of 100 seats for friends and family. She finished fifth in the end but more than made up for her podium miss with massive airs, far bigger than the rest of the field, in the deep end. Flat-track racing, one of the oldest forms of motorcycle racing that has been around since the early 1900s, is experiencing a resurgence in popularity. Fans packed the stadium Sunday morning to see it all go down. Here, eventual silver medalist Briar Bauman speeds through a quarterfinal race on his way into the final round. Hooligan racing is like the amateur form of flat-track racing, and has attracted scores of aspiring pro riders into the field. One of the more colorful racers in Sunday's Harley-Davidson Hooligan event was Mark Atkins, above. We'd show you a picture of his overall style and bike, but some of the things printed on it are NSFW. Hopefully we'll see more of this character in coming years. In a touching tribute that opened up X Games Minneapolis 2018, friends and family of BMX rider Kevin Robinson gathered to pay their respects to the X Games legend, who died in December 2017. Here, Kevin Robinson Jr. gets a running start up the vert ramp to touch a sticker of his father. 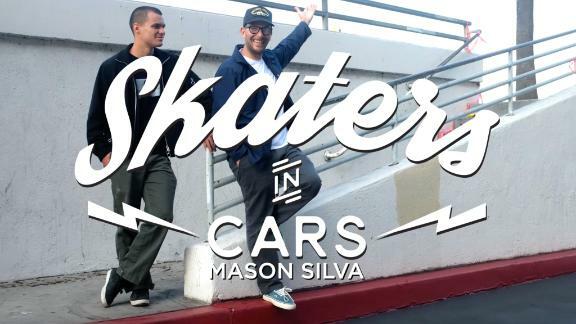 A lot can happen in a year, and in Men's Skateboard Street terms, a year is essentially an eternity. In 2017, local boy Alec Majerus took silver in street. But one year later, he couldn't replicate his success. Despite having the largest cheering section of the weekend, Majerus had to settle for seventh in the finals. Between unique transfers, moto-influenced style and some of the most inverted 360s of the weekend, Larry Edgar's BMX Park runs attracted a steady stream of attention throughout X Games Minneapolis 2018. In the end, Edgar settled for sixth place, but he did so without going the usual trick, trick, trick route. Brighton Zeuner impressed in her X Games debut in Austin 2016 but won X Games Minneapolis 2017 by skating with more power and confidence than ever before. In 2018, she came back taller and stronger with more bangers and the poise to land them. Following a few confident runs, her back-to-back gold-medal win was no surprise. It has been a long time coming for Australia's Logan Martin, but he finally brought everything together for his first gold medal in BMX Park at X Games Minneapolis. 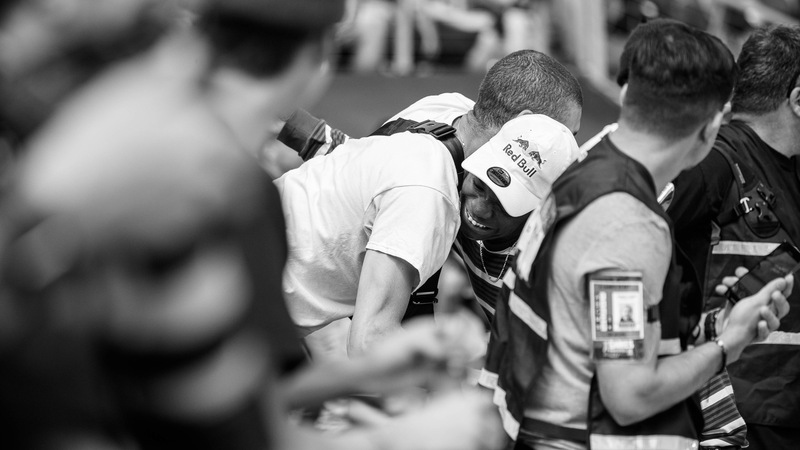 Following his win, Martin ignored the crowd and embraced his girlfriend in a long, passionate kiss. 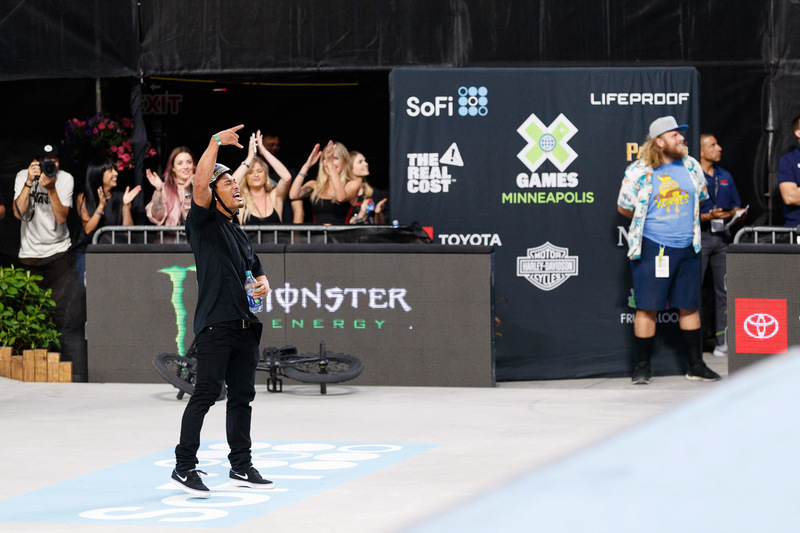 Fresh off a lingering knee injury that sidelined him for a good part of the first half of the year, Nyjah Huston's first competition back was X Games Minneapolis. After an early stumble, Huston nailed the top run of the competition and maintained the lead through to the end. It's safe to say: Nyjah Huston is back. 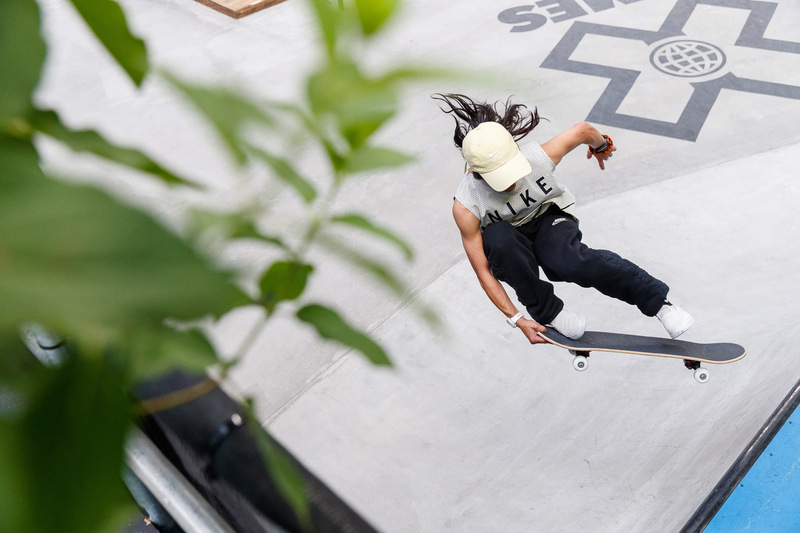 Sixteen-year-old Aori Nishimura came into XG Minneapolis 2018 as the defending gold medalist in Women's Skateboard Street, and on Saturday afternoon it looked as if she was on track to repeat. Then Mariah Duran dropped in for second run and blew away the competition, knocking Nishimura down to the silver-medal spot. 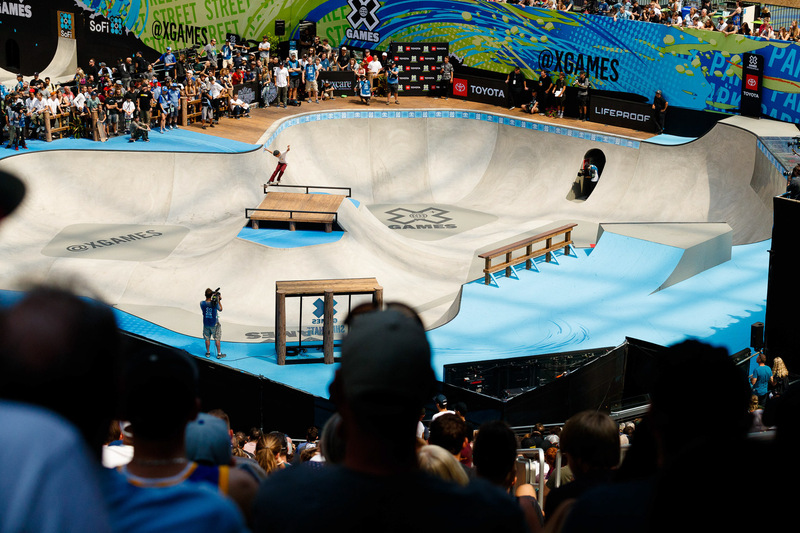 Heimana Reynolds skated his second consecutive Skateboard Park comp at X Games without wearing a shirt and delivered some of the most stylish and intense runs Saturday. Unfortunately, Reynolds finished off the podium, but his time is sure to come. 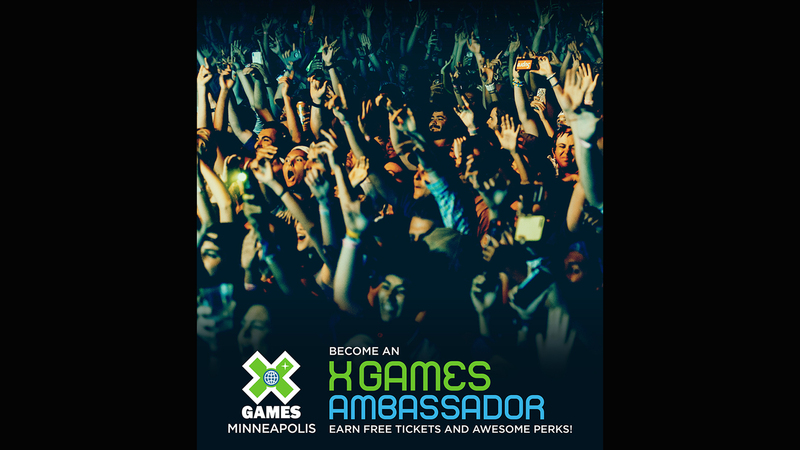 Tom Parsons broke his wrist two weeks after X Games Minneapolis 2017. He hasn't been able to ride in almost a year, and just started training a week ago for this year's event. 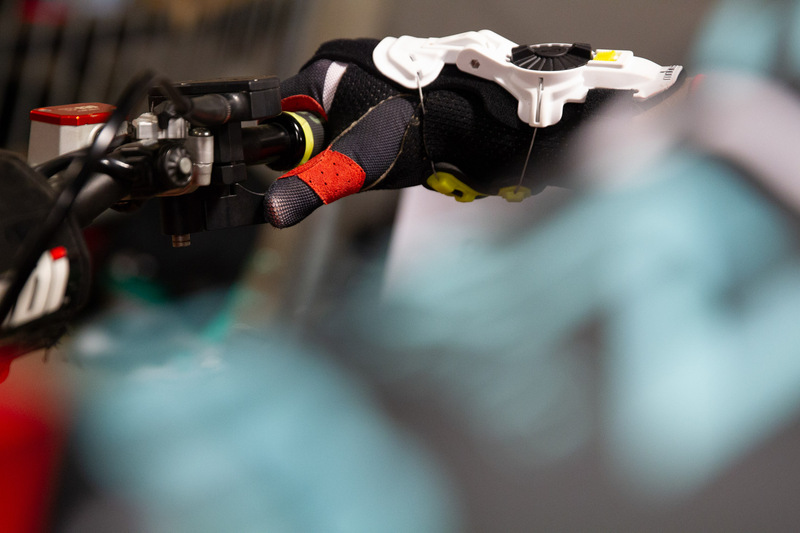 He can't twist a normal throttle with the way his wrist is now, so has adapted a thumb throttle to ride. He's the only rider to ever compete with a thumb throttle. Axell Hodges does a turn up in Saturday's Moto X Best Whip, earning him a bronzea and bringing his total medal count for the weekend to two with Friday's QuarterPipe High Air gold. Two-time Women's Skateboard Street gold medalist Pamela Rosa skated well in Saturday's final but failed to medal. She managed to entertain the crowd, nonetheless. Keegan Palmer, 15, finished second behind Jagger Eaton in the X Games Minneapolis 2017 Am Park final. He didn't finish high enough in the X Games Boise Skateboard Park qualifier to earn a spot to this year's pro-level Park competition but was put on the alternate list for Saturday's contest. Two injuries later and the pint-sized skater found himself in the main event. Hot on the heels of an amazing Thrasher Magazine video part, Clay Kreiner landed at X Games Minneapolis 2018 to compete in Skateboard Vert, Park and Big Air. 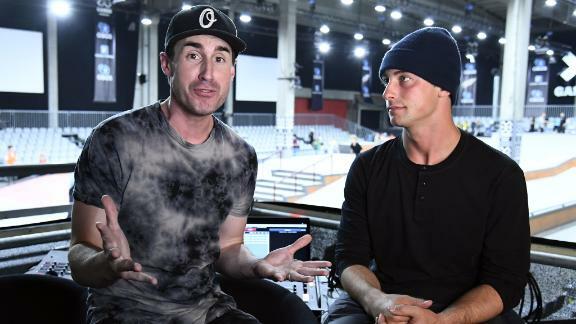 No other skater invited to X Games even attempted to skate three events, but Kreiner skated each event in style and even earned a silver medal in Big Air. 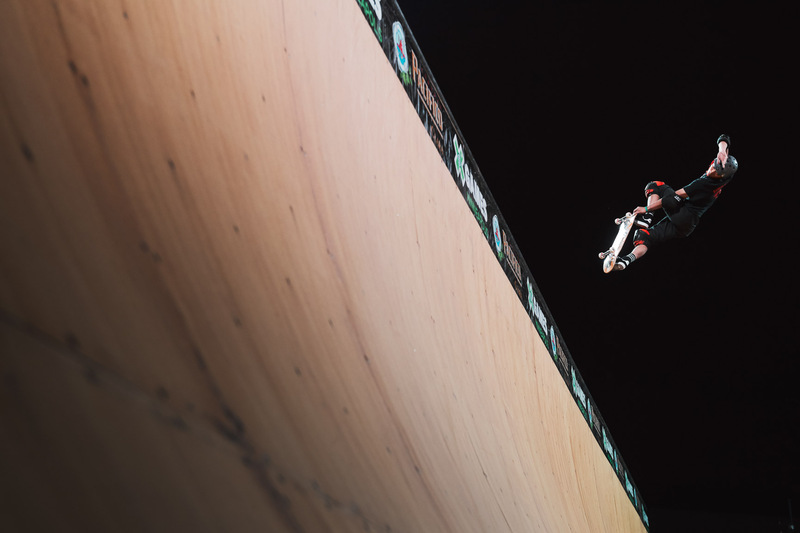 Competing in his last of three events, Clay Kreiner landed a 720 over the gap in Skateboard Big Air and followed it up with a mind-blowing 22-foot-2-inch-high alley-oop varial to earn himself a silver medal Saturday night at X Games Minneapolis 2018. No one else can whip their FMX bike the way Jarryd McNeil is doing here. He is the smallest rider in the Moto X field and it's generally agreed that, looking at him, it doesn't seem as if he should be able to throw whips this technical and high. 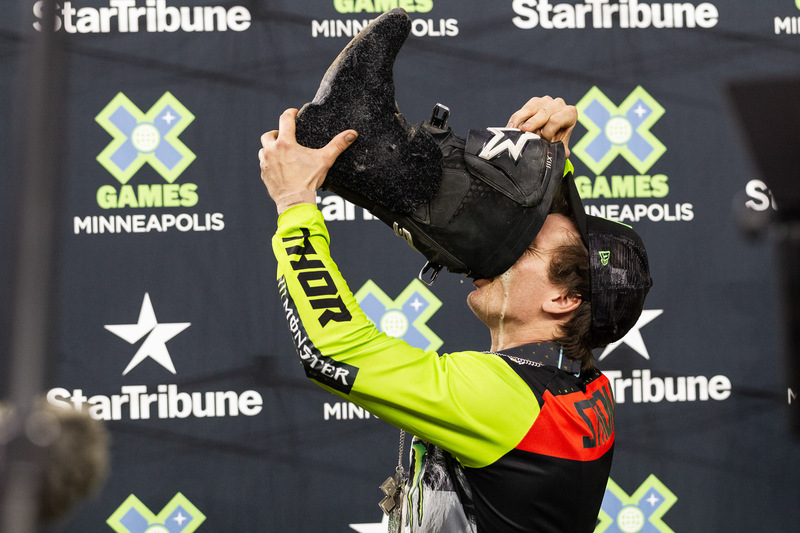 But he can, and it earned him a gold metal in Moto X Best Whip Saturday night at X Games Minneapolis. 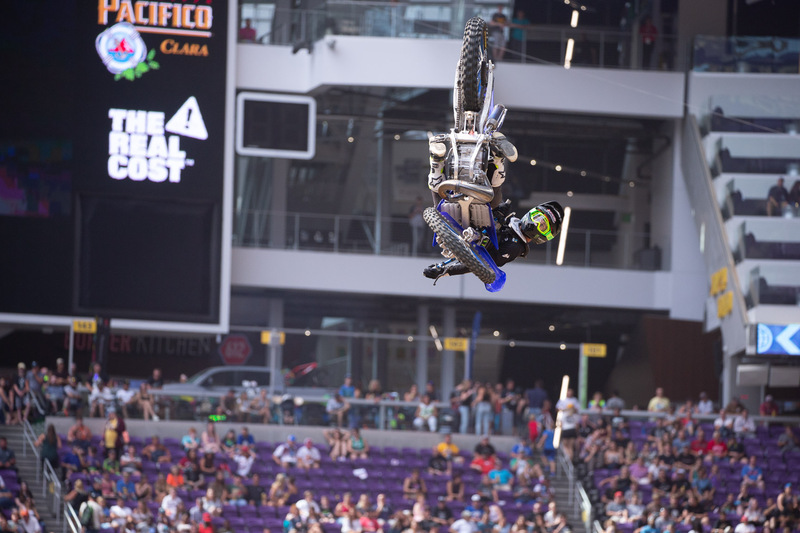 McNeil has medaled in every Whip event he has entered since 2010. Just a few weeks ago at Street League, Zion Wright fell between a gap on the course and slammed his head into a ramp. 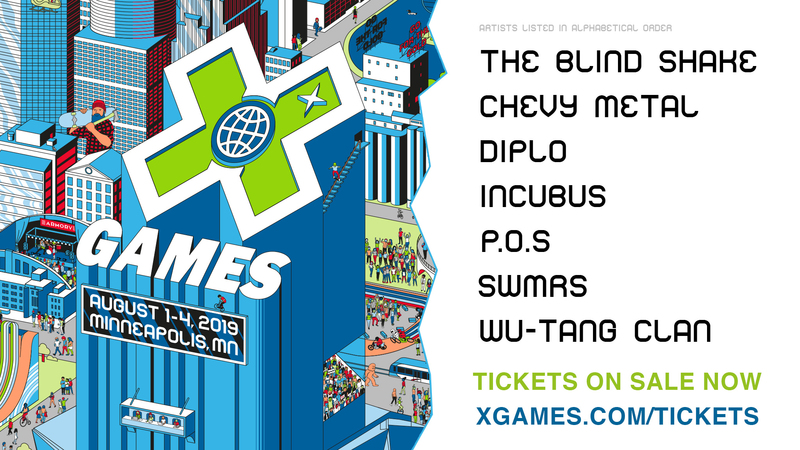 Before X Games Minneapolis 2018, he removed the staples from his head on his own, grabbed his board and proceeded to destroy his runs in Friday's Monster Energy Men's Skateboard Street qualifiers. Wright advanced to the final and will skate again on Sunday at 2:15 p.m. CT.
Just a year ago, Jenn Soto was a full-time pizza cook in New Jersey. Then Adidas sponsored her, enabling her to move to Los Angeles and pursue her skateboarding passion full time instead. She made the podiums of the past two contests she entered, coming in second at the Dew Tour Long Beach in July and first at the Street League Pro Open London in May. Unfortunately, she didn't advance out of the SoFi Women's Skateboard Street qualifier on Friday, but this is far from the last that we'll be seeing of this young style-phenom. 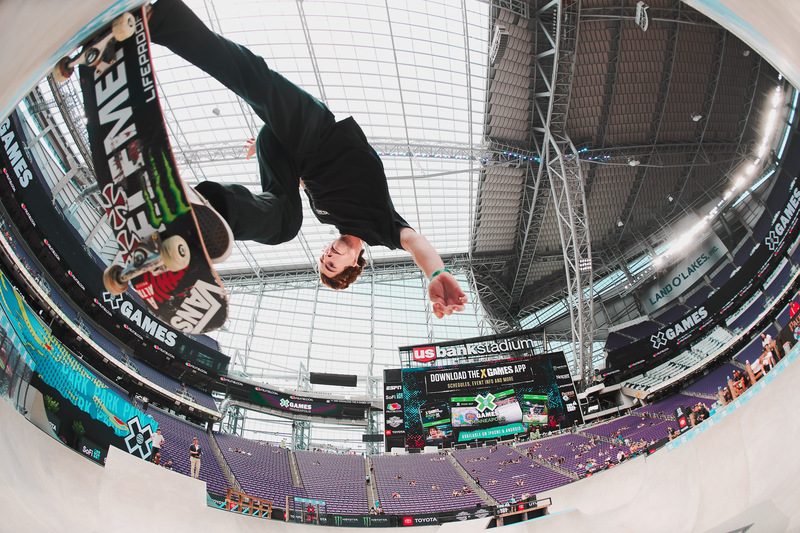 Tom Schaar, X Games Minneapolis 2018 Skateboard Park and Big Air silver medalist, practices for the event on Thursday, looking to raise last year's finish to a gold standard. 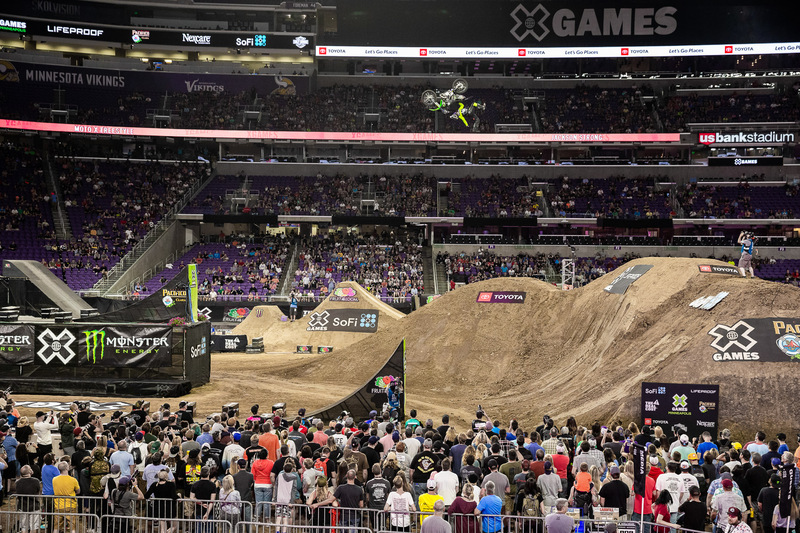 Women's BMX was celebrated with a BMX Park demo before the start of Friday night's finals at X Games Minneapolis 2018. With a stacked crew, good vibes and some healthy progression, the women of BMX continue to push the envelope. Here, New Zealand's Ellie Chew backflips out of the Park course. Jackson Strong's one-handed Indy backflip is not a trick usually seen in a Moto X Freestyle contest. 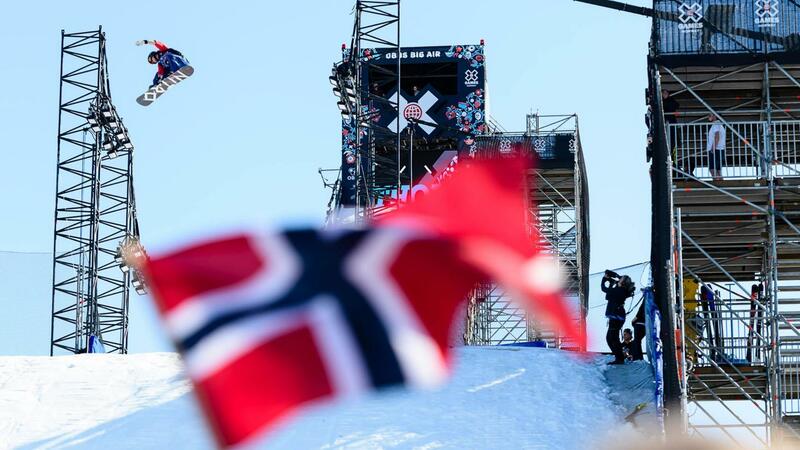 The uniqueness of it helped propel Strong to a first-place spot in Friday's final, which he held onto until Tom Pages' final run, which pushed him into the silver-medal position. Though he has a Best Trick gold to his credit, this was Strong's first time medaling in an X Games Moto X Freestyle competition. 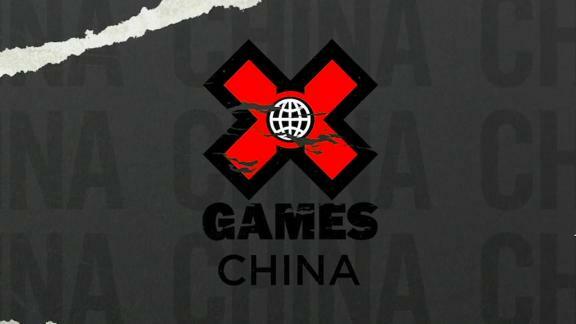 Historically, BMX Street at X Games has often gone to the winning hands of Garrett Reynolds. 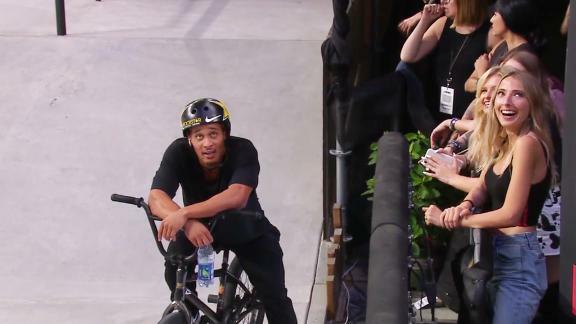 One person, Chad Kerley, was able to beat Reynolds in 2013, but Reynolds regained the gold in 2014 and held onto it tight ... that is, until Friday at X Games Minneapolis 2018. 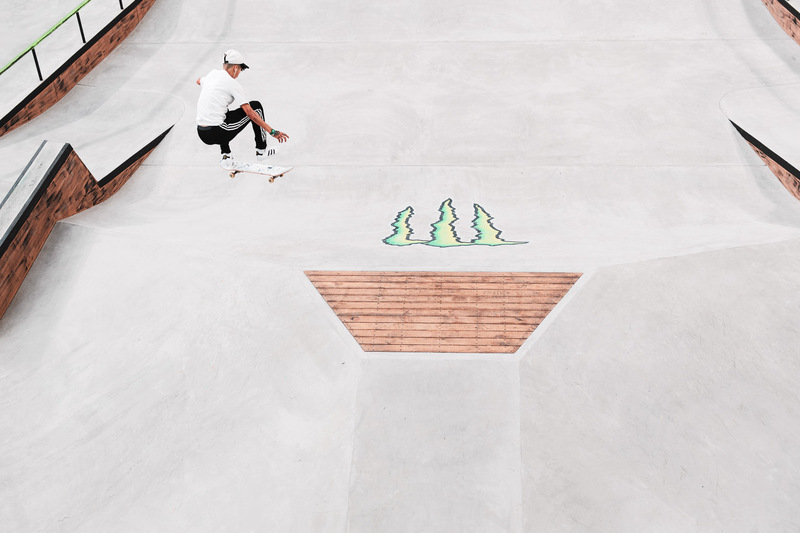 Kerley was able to creep past Reynolds in his final run, claiming his second gold medal at X.
Gavin Bottger, an 11-year-old phenom, skated his way into second place, and our hearts, in the Next X Skateboard Park am contest on Friday, on a board that is almost as big as he is. Look to see him in the pro competitions in the next few years. 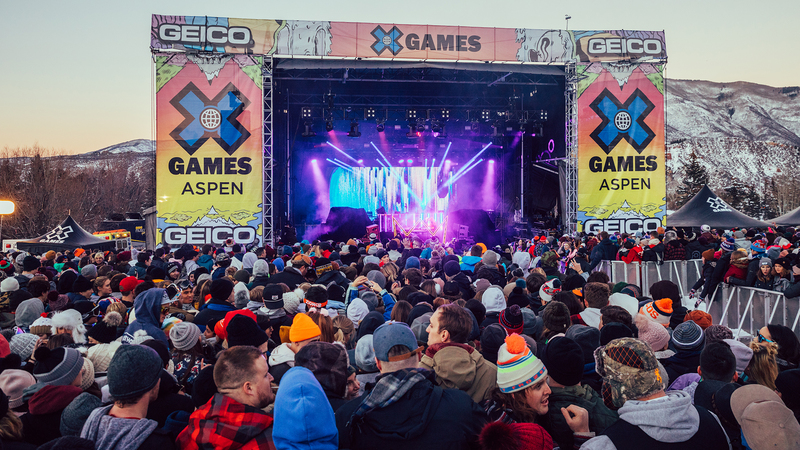 Rob Adelberg finished second in Austin 2016 Moto X Freestyle and won the inaugural Snow Bike Best Trick competition earlier this year at X Games Aspen 2018. He has been putting hours into the foam pit and hit the Freestyle competition hard Friday night, throwing a front flip out of the gate, which ultimately won him a bronze medal. 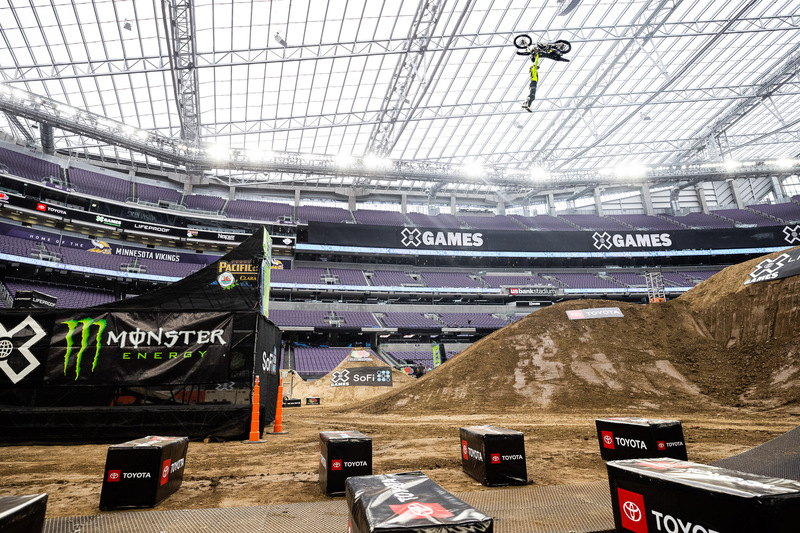 He has the potential to win Moto X Best Trick in Minneapolis. Kate Shengeliya jokes that she was born to skate. Her birthday is on June 21, a date celebrated around the world as Go Skateboarding Day. And as a schoolgirl she says her name was always listed by her last initial and first name, S. Kate. She says the Russian Skate Federation has dramatically increased support for her and other skaters, in anticipation of the 2020 Tokyo Olympics. Unfortunately, she didn't advance out of Friday's SoFi Women's Skateboard Street qualifier into this year's final. Tom Pagès' gold-medal-winning run -- with the tricks that he does, at the height at which he does them -- was so high risk that it was a win-or-go-home play. 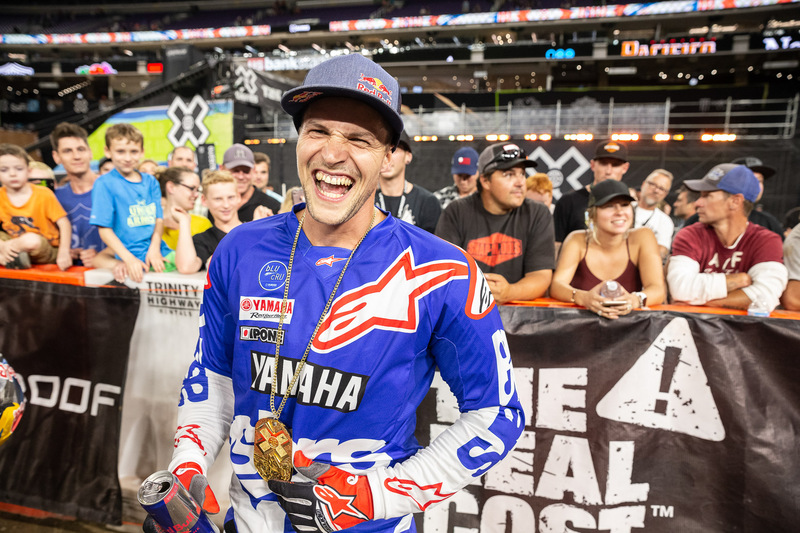 Though he started competing at X Games in 2008, this was his first time winning a Moto X Freestyle medal -- gold, silver or bronze. Twelve-year-old Myles Strampello, from Huntington Beach, California, entertained the crowd at Friday's Next X Skateboard Park am contest with his decision to skate the event shirtless. This seems to be a trend among the next generation of X Games Park skaters, with Jagger Eaton skating the Boise Park qualifier sans camisa, and former Next X, current X Games Skateboard Park competitor Heimana Reynolds flying shirtless as his modus operandi. 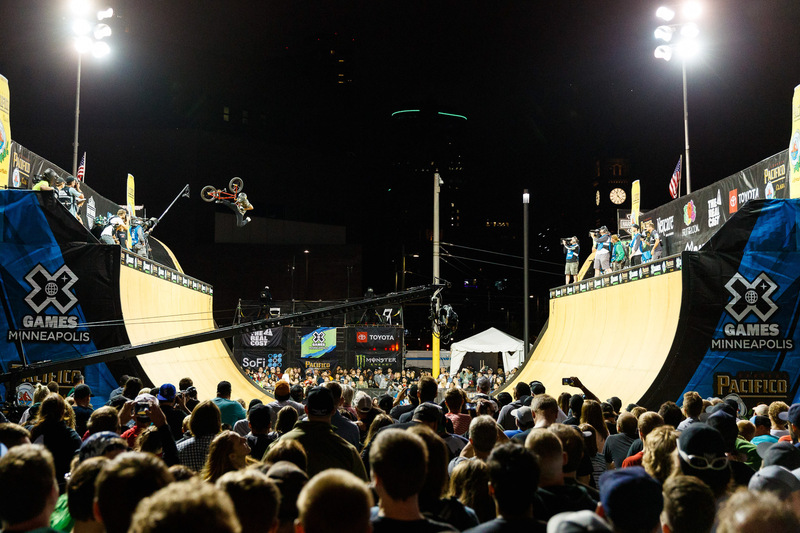 Paul-Luc Ronchetti kicks off X Games Minneapolis 2018 in Wednesday's Pacifico Skateboard Vert Qualifier, held in front of U.S. Bank Stadium as the sun set. 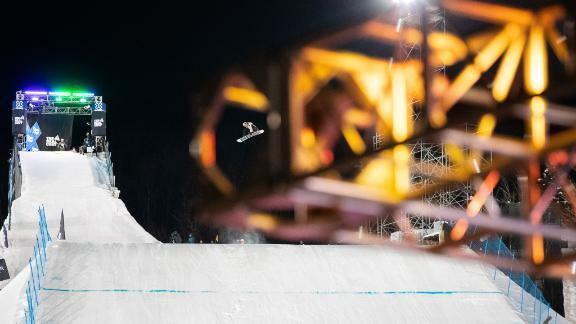 Ronchetti's sixth-place finish earned him a spot in Thursday's Vert final, where he finished in seventh place. 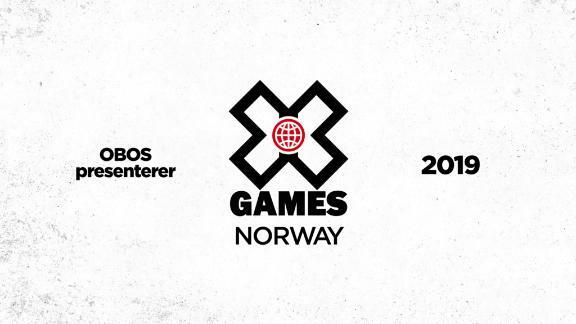 Dutch Skateboard Street competitor Candy Jacobs has yet to medal at the X Games, but she finished just one place off the podium at X Games Norway 2018 and is coming into this event hot. Here she is taking a quiet moment during practice on Thursday. When he placed second at X Games Austin 2016, Moto Shibata was the first male Japanese skater to medal at the X Games. 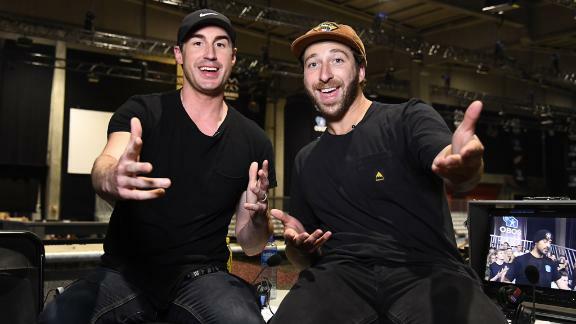 He followed that up with a gold at X Games Minneapolis 2017, but was held to a silver in Thursday night's Pacifico Skateboard Vert final by eventual gold medalist Jimmy Wilkins. 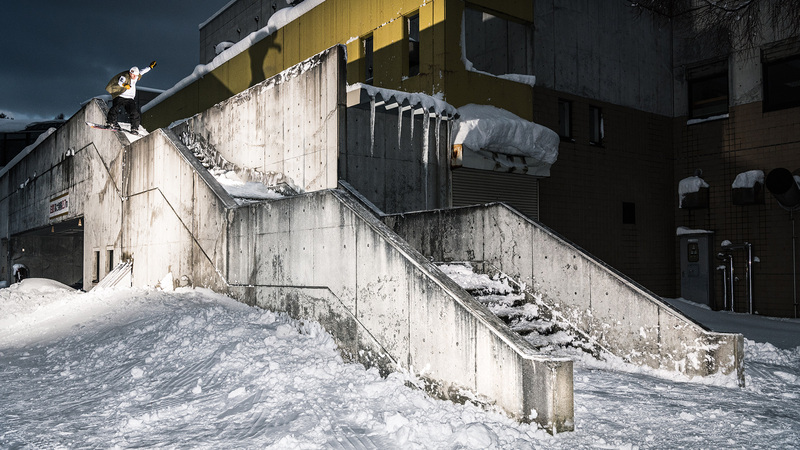 Raised on 1980s skateboarding videos, Shibata brings a style not seen on the vert ramp in decades. 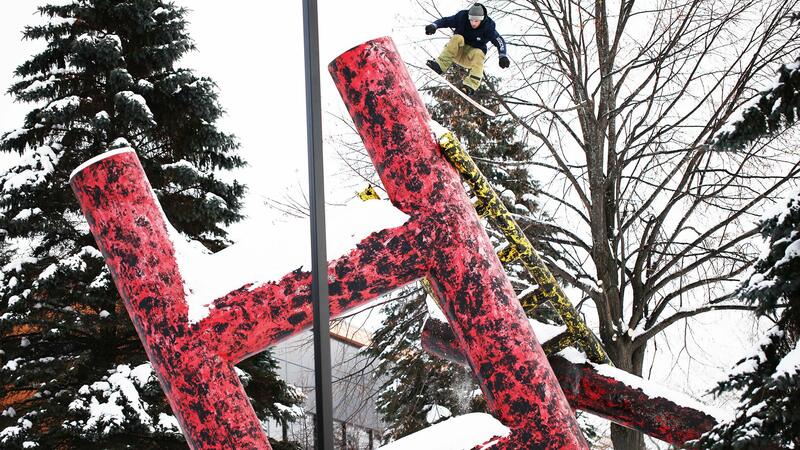 At the moment, teen phenom Evan Doherty is still listed as an alternate on the start list for Skateboard Big Air. But things change quickly at X and the pint-sized booster might get a shot at the big time when the competition goes down on Saturday night at 8:30 p.m. CT.
Mykel Larrin does a griz air in the Pacifico BMX Vert final, his first of three competitions this week. Larrin will also compete in BMX Big Air on Friday and Park on Sunday. The nac nac was frowned upon for ages in BMX Dirt, but in recent years, it has made a mighty resurgence for good reason. Here, during BMX Dirt practice on Thursday at X Games Minneapolis 2018, Alex Nikulin throws a new one into the nac nac lexicon: The front flip nac nac. 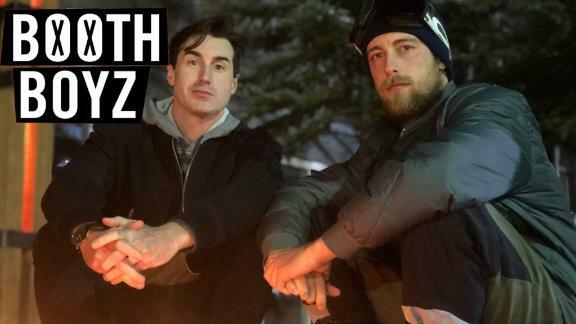 Axell Hodges was riding a quarterpipe in Calgary with Twitch and Kris Foster for ten days straight leading into this event. He sent it higher than ever on his first hit in practice and is a clear favorite to win gold when Moto X QuarterPipe High Air hits the stage on Friday night at 7:45 p.m. CT. In past years, Haro BMX pro Dennis Enarson was invited to multiple BMX events at X Games, but instead chose to narrow his focus and concentrate on one discipline. 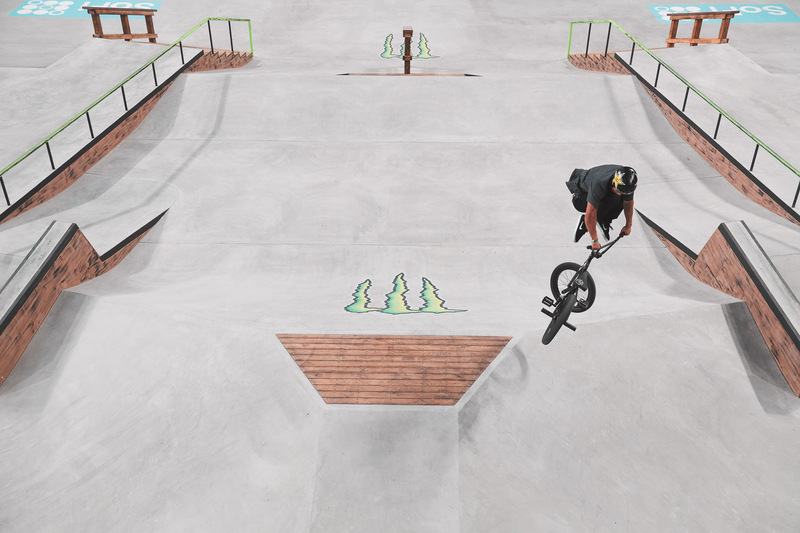 This year, Enarson accepted the multiple invites and is expected to compete in BMX Park and Street. 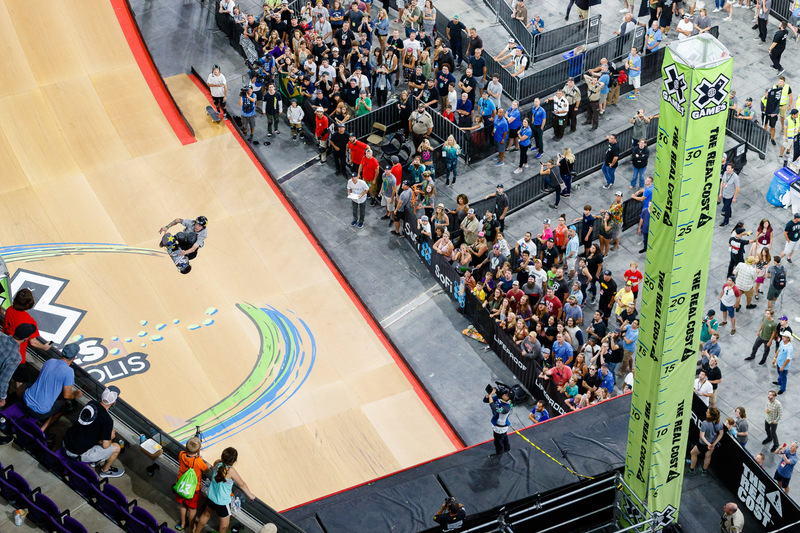 Italo Penarrubia broke the X Games high air record on the Big Air ramp in 2017 with a 23-foot, 10-inch air. 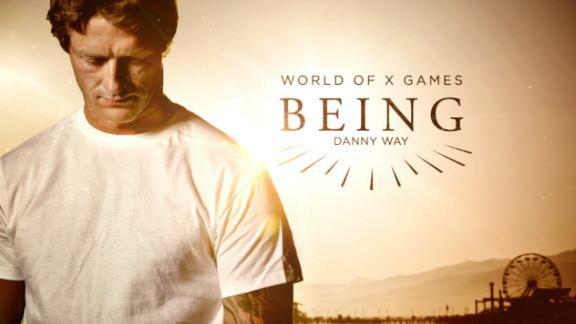 He wants to break the Guinness World Record of 25 feet set by Danny Way. He'll get his shot on Saturday at 8:30 p.m. CT. But first, Penarrubia tried his hand at Skateboard Vert. Unfortunately, he didn't advance out of Wednesday's Qualifier. In the realm of BMX Street, San Diego native Chad Kerley is among the most stylish and most consistent to hit the competition circuit. 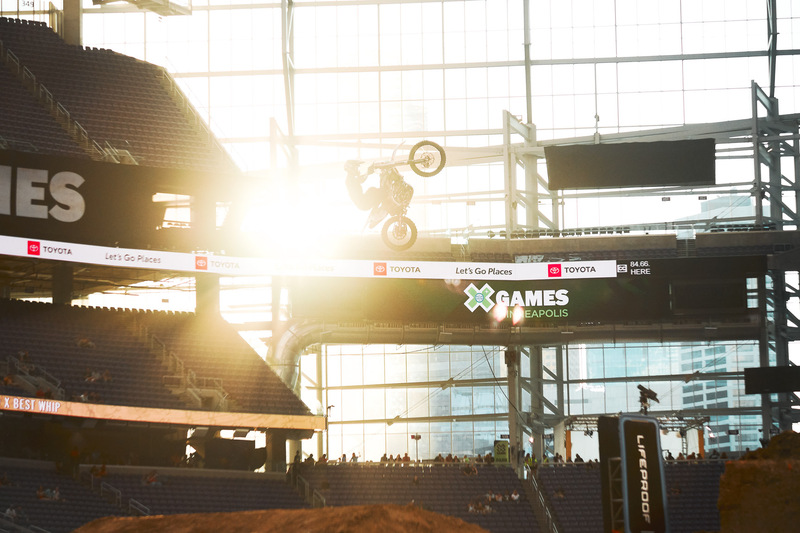 Here, Kerley tailwhips his way through practice on Day 1 of X Games Minneapolis 2018.